I cannot believe Thanksgiving is a week from today. My mind is blown as to how fast 2015 zipped by us. 2015 marked the 10 year anniversary of my milestone year. In 2005, I bought my first house, paid off my car, got my first promotion at work - I thought I was an adult who knew everything. Funny, I look back at that 25 year old and smirk at her. Since Black Friday is only days away, I wanted to share a brand new product with you, the Shark® Rocket Powerhead Vacuum . Let's rewind back to 10 years ago first. After I closed on my first house, the first investment I made was an expensive vacuum cleaner. I'm a bit of a label snob and spent a pretty penny on a Dyson. I figured a $500 vacuum cleaner would be the answer to my cleaning nightmare, also known as this cute ball of fur. My cat Boo-Kitty may be a cutie but he is a shedding beast. Even a $500 Pet Vacuum cleaner didn't match up to him. Every time we vacuum, we have a fake funeral to his "fur babies" because we literally get enough fur to cover a few kittens. When Shark reached out to me to review their brand new Shark® Rocket Powerhead Vacuum , I jumped at the chance. The reason being, my Mom bought me a Shark Sonic Duo Carpet and Hardwood Floor Cleaner for my Birthday 5 months ago. She had one and I loved the fact that it works on Carpet and Hardwood, is lightweight and moves with ease. 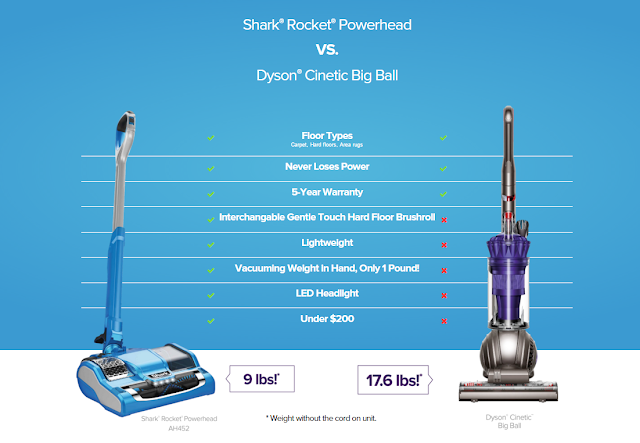 When I learned the Shark® Rocket Powerhead was a full size upright Vacuum cleaner without the bulk or weight, weighing in at only 9 pounds (not including the cord), I knew this would be the machine to replace my Dyson. How mighty can a 9 pound Vacuum cleaner be? You would be surprised! The Shark® Rocket Powerhead is full of features but my favorite, besides the lightweight is the maneuverability. With Dynamic Power Steering, you can literally guide the Vacuum cleaner with one finger and lift it with one hand. It lays flat so you can get hard to reach places, such as under your bed (HUGE perk for Pet-owners) and is so light you can easily lift it to Vacuum your couch! 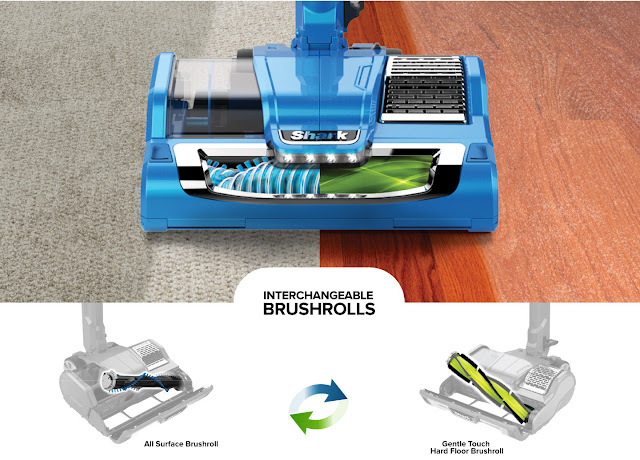 This is all possible thanks to Sharks breakthrough engineering combined the motor and dust cup in the head of the vacuum which reduced airflow path and maximizes efficiency and power. There are two different brushes, one for hard floors and one for carpet. It's super easy to switch them out and since there isn't a belt, you don't have to do anything but remove, clean and replace when you switch rooms. Our Condo is primarily tile and hardwood. We have carpet in our bedroom - so this convenience factor is a huge plus. I've always Vacuumed my tile and hardwood but it never did the same job as a broom, until now. I 100% suggest this product and expect the Shark® Rocket Powerhead to be a popular item this holiday season. It's available at all major retailers and MSRP for $169. Shark provided me with product for this review. As always, all opinions are my own.